With mountain peaks, beautiful monasteries, yaks and yetis to various other must-visit sites and must-enjoy traveling experiences, Nepal does not run out of treasures to surprise its travelers. Situated along the Himalayan mountain range, Nepal is a country, which must be visited by travelers who love mountains, monasteries, colorful markets and tasty cuisines. We offer an exciting range of Nepal tour packages, which includes- honeymoons holidays, adventure tour, romantic holidays, family holidays, heritage & culture tour, beach holidays/ beach island tour, wildlife tour and group holidays. We offer these holiday packages at affordable rates and we customize these packages according to the different requirements of our diverse community of clients. 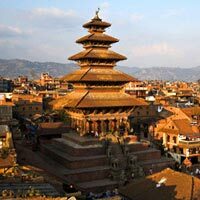 We are based in Dumdum, Kolkata and we offer tour packages to travel around the whole of Nepal.